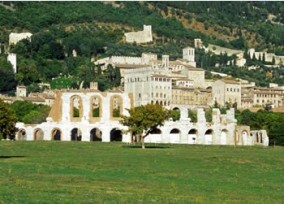 The Gubbio Roman Theatre has been constructued during the first century aD. by using square blocks of limestone from the local area. The walls' covering is ashlar. The tiers, having a diametr of 70 meters, are divided by short stairs in four parts. Externally to the tiers there is a colonnade of arches on pillars. The upper one, with another colonnade, today missing, would have formed a portich going all around the theatre. In summertime (July/August) it becomes a suggestive scenario for playing masterpieces of classical authors.